Want to enjoy cycling with a group of fun-loving, like-minded women who enjoy riding together? If so, then, SheBikes is for YOU! Cherry Capital Cycling Club is sponsoring 6 weekly rides for SheBikes from mid-May to the end of June. While focusing on beginning & intermediate women cyclists, these rides are open to all ages and ability levels. The goals are to ride various routes and distances on Old Mission Peninsula, how to ride enjoyably and safely in small groups, to prepare participants for further fun with CCCC rides that are scheduled almost daily throughout the riding season and to simply, have a great ride, suited to you. Club ride leaders will review rules of the road and other topics each week – for example, how to fix a flat tire and some basic bike maintenance. 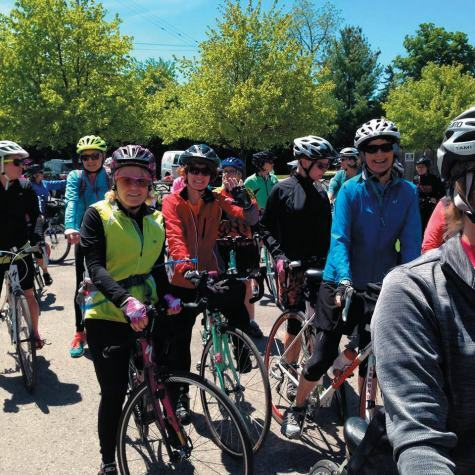 The SheBikes organizational meeting will be on Monday, May 6th @ 6:00 PM at McLain’s Cycle, 2786 Garfield Road, Traverse City. Bring a snack and/or beverage to share. Rides will start Monday May 13th, and will be posted on the “Calendar” on the Club’s website www.cherrycapitalcyclingclub.org. We meet at the Traverse City Central High School, at the corner of Eastern & Milliken. Roll out starts at 6 pm, so please show up early to sign in, get your gear ready and break into smaller groups, based on pace and distance. Any questions about the ride can be directed to Linda Deneen (email: deneendaisy@charter.net) or Bill Danly (email: wbdanly56@gmail.com). If you’re not a member of the Cherry Capital Cycling Club, you’re invited to ride with us and check us out!